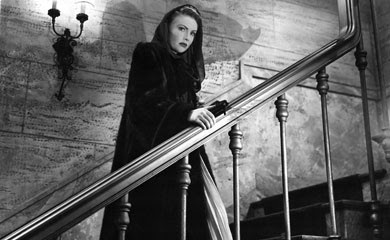 One of the defining elements of noir is, of course, fate, whether real or imagined. Characters lash out at fate, convinced it’s out to get them, no matter what they do, or characters are bound to fate, determined to overcome it, only to find themselves as boats beating against fate’s current. And if fate often works as an agent of plot, it also becomes an effective means of placing human agency squarely under the microscope, asking how much pull our own decisions have, and whether the course of our own lives is written by us and our own impulses, whether best or worst, or by supernatural forces beyond our control. “Repeat Performance” (1947) takes the notion of supernatural forces literally, utilizing the mystic to explore the influence we have in the shaping of our lives, re-imagining “It’s a Wonderful Life” not as a chance to see what life would like without you but getting a chance to go through part of your life all over again. 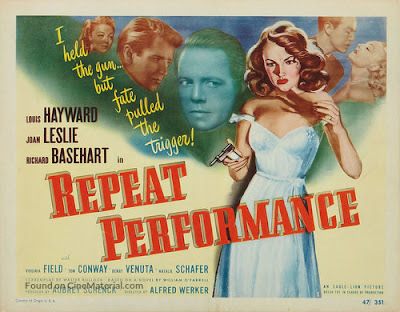 “Repeat Performance” opens on New Year’s Eve 1947 with Sheila Page (Joan Leslie) having just shot dead her alcoholic husband Barney (Louis Hayward) and fleeing the scene. She finds her friend, a poet, William Williams (Richard Basehart), who leads her to the apartment of theater producing pal, John Friday (Tom Conway), a sequence embellished with an overwrought score foreshadowing the movie’s melodrama, as well as equally melodramatic, even un-noirish, narration, spoken not by Sheila from, say, some place in the future looking back, but an omniscient narrator explaining precisely what’s about to happen – that is, Sheila, wishing she hadn’t pulled the trigger, wishing she could get another crack at it, and suddenly finding herself whisked back to New Year’s Eve 1946. She makes this realization upon turning around to find William has vanished from the stairs, and in subsequent conversations with Tom, and in returning to home to discover, yes, Barney, is still alive and kicking, not yet on a never-ending bender. The movie itself does not give Sheila much time to adjust to this sudden cosmic alteration, but it doesn’t need to; it has Leslie’s eyes. They become big, round, searching, first in a confused, even terrified manner, like someone who’s spent a long time in the dark and now is trying to adjust to a whole new place, though eventually they seem to betray a kind of round the bend recognition of what has happened. And as she initially settles into her 1946 redux, Leslie emits an air of politeness almost to the extreme, akin to her friend William when he winds up later in a mental institution. Whether it’s real or not, and the movie seems to suggest it is, Sheila has reached some level of acceptance. This crazy-eyed acceptance, in fact, gives great rise to the rest of her performance for even as her character warns William of his impending placement in a mental institution, tries to curb her husband’s drinking problem and fend off his forthcoming affair with a devious playwright named Paula (Virginia Field), she also resettles right into the script. In that way, the movie’s taking place in the theater world, with Sheila once again assuming a role written for her Paula even as she allows Paula right back in to Barney’s orbit, evokes the idea of our respective lives as roles we play, beholden to the cosmos’s script. Yet at the last minute, the characters find a way around the fatalism, which might not have been so bad if it came across more like life’s actors going off script in the middle of the performance than the actual movie’s screenplay writing off the very real problems of William as a plot necessity.